There are a number of reasons why a person might pursue a passenger van. The vehicle is the perfect choice for businesses, especially private schools or nursing homes. Giant families may even opt for this vehicle if they’re required to bus around a dozen children. These types of vehicles are surprisingly versatile, explaining why they can appeal to so many different types of drivers. There’s no denying that the 2017 Chevy Express is the brand’s biggest vehicle, and such a large ride requires plenty of power under the hood. Fortunately, the brand’s incredible 6.0-liter V8 engine delivers all of the muscle you could possibly need. The unit is capable of pumping out 342 horsepower, although customers could alternatively opt for the 285-horsepower 4.8-liter V8 engine. You may be overwhelmed with this amount of power, but the accompanying mechanics makes the Chevy Express incredibly easy to control. Inclusions like the Hydra-Matic six-speed automatic transmission provide a smooth, effortless ride. The system also includes technologies like the Tap-Up/Tap-Down Driver Shift Control (as well as auto grade braking), making it very easy to slow down your hulking vehicle. If you’re going to be relying on your 2017 Chevy Express as a passenger van, then you’ll want to be assured that all of the vehicle’s occupants are safe and secure. Fortunately, Chevy’s engineers included a number of safety features that should help protect passengers. The head-curtain, side-impact air bags will provide the necessary amount of cushion for passengers, as will the innovative seat-mounted thoracic air bags. Meanwhile, the enhanced technology glass shouldn’t be compromised during a collision, providing even more protection. Of course, Chevy also includes a number of technological features that should play a role in preventing accidents from occurring in the first place. For instance, the StabiliTrak Electronic Stability Control System should help prevent swaying and keep your vehicle on its intended path, thus helping you avoid any crashes. Meanwhile, the rear vision camera allows you to monitor everything that’s occurring behind your vehicle, while the available Park Assist system will come in handy when you’re trying to squeeze the giant vehicle into a tight parking space. Finally, the Tire Pressure Monitoring System prevents the guessing game that often accompanies tires, as drivers can anticipate when they need a refill. In the event of an emergency, drivers can rely on the brand’s OnStar Automatic Crash Response system. Thanks to this inclusion, occupants will automatically be connected to an OnStar advisor, who can subsequently connect you to emergency personnel. There are many reasons why drivers should appreciate the 2017 Chevy Express’s interior, starting with the incredible amount of interior room. The vehicle generally offers seating for up to 12 occupants, although drivers can boost this number to 15 by opting for the extended wheelbase. Thanks to the inclusion of rear swing-out doors, rear passenger doors, and an available sliding rear passenger door, owners won’t have any issues loading passengers or cargo into the Express van. Unlike other passenger vans, the 2017 Chevy Express won’t be overly stuffy or uncomfortable. The power front windows provide easy access to the fresh air, and drivers can also opt for rear passenger air conditioning, meaning your occupants can consistently stay comfortable. There are also an assortment of available accessories that should improve the driving experience, including the Hitch-Mounted Storage Container. By opting for this feature, drivers won’t have to worry about their cargo rolling around in the back. Speaking of cargo, you shouldn’t have any worries about loading passengers or equipment into your Chevy Express. The vehicle had a maximum payload of 3,449 pounds, which is more than enough weight to accommodate any occupants or cargo. If you somehow can’t fit all of that cargo into your new purchase, then you can rely on the 9,600-pound maximum towing capacity. The 2017 Chevy Express’s interior is also highlighted by a range of technological features, providing occupants with unmatched convenience as they’re traveling in their vehicle. The 120V power outlets and the pair of auxiliary outlets means occupants can consistently keep their gadgets charged, so passengers can expect to complete work while they’re on the road. The USB port serves a similar purpose, allowing occupants to charge their smartphones. If drivers require wireless internet, then they can rely on the built-in 4G LTE Wi-Fi. The system is capable of accommodating up to seven different devices, so your passengers surely won’t be arguing over who gets access. Perhaps the most appreciated technological inclusion is the Chevrolet MyLink seven-inch diagonal color touch-screen system. The unit provides drivers access to a number of useful applications, including an extensive, step-by-step navigation system. Plus, thanks to the Bluetooth connectivity, drivers can access an array of functions via the sound of their voice. That means they can appreciate all of the amenities without taking their eyes off of the road. Drivers can even access the brand’s innovative technology when they’re not behind the wheel of the 2017 Express van. The myChevrolet Mobile Application allows owners to remotely access their vehicle, meaning they can lock/unlock doors or operate the engine from their smartphone. Drivers can also view their vehicle’s diagnostics, or they could send directions directly to their vehicle. If you’re going to be relying on the 2017 Express to help serve your business, then you can also monitor the ride’s location, efficiency, and speed thanks to the brand’s Commercial Link system. This allows you to keep complete tabs on your recent purchase. 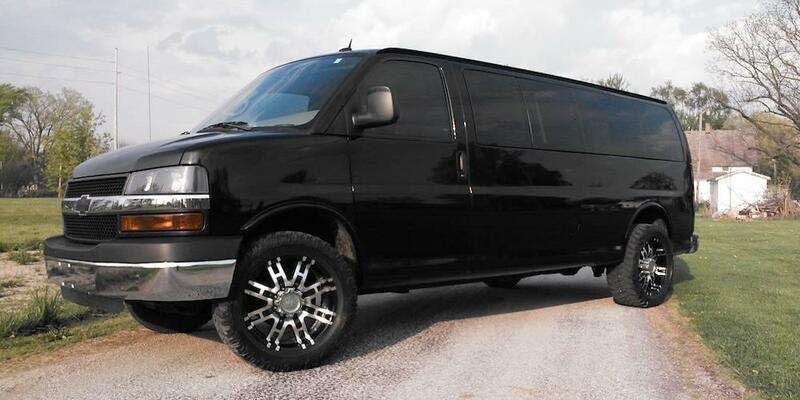 Fortunately, it isn’t just easy to determine that the Chevy Express is the perfect passenger van. It’s also extremely easy to figure out where to purchase said passenger van, and that’s DePaula Chevy in Albany, New York.